How we interact, interpret and see our environment determines who we are. This is the foundation on which developmental or behavioural optometrists operate. Vision therapy practitioners often see the refractive behaviour of an individual before it is measured because there is a strong relationship between vision and personality. For instance, people who are nearsighted are more likely to display certain personality patterns and mannerisms that are different from those who are not. 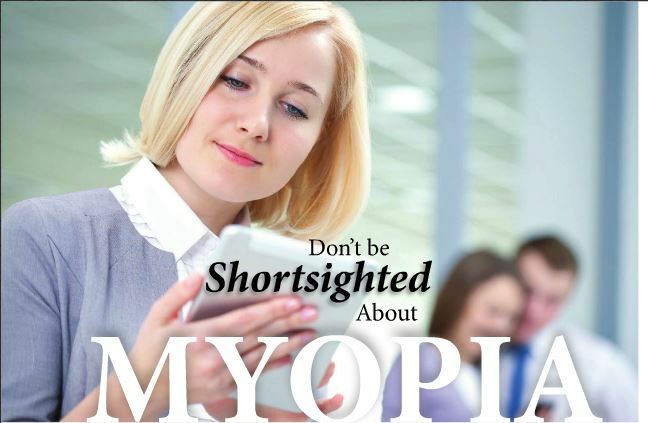 It is important to understand that a significant number of vision problems, including myopia, are the result of mal-adaptations to the stresses in our environment or improperly learned patterns that we develop in life. We are not born with poor vision. There are, of course, people who are born with congenital cataracts or distinctive visual dysfunctions but they represent only a small percentage of the population. Most people are born without vision issues. Vision is a process that develops and is learned. So, how do people become myopic and how do they relate to their world? Everyone, admittedly, is spending more time indoors, reading and working on computers and digital devices. The increased demands in our near-centred culture cause strain in our visual system as we adapt to meet the near visual stress, often at the expense of clear distance vision. Myopia development begins at near because it is a symptom of a near-point visual dysfunction. When nearsighted people are exposed to external pressure, their perception is always pointed internally. They respond, either by constricting their physical world closer to them, or by withdrawing from their environment for security in a flight response — without actually running away — when things get too challenging. The internal responses they demonstrate are often charged with emotion that quickly becomes their customary pattern. They are in survival mode and have developed this way of seeing to protect themselves. They are frequently introverted, socially insecure and reserved. More often than not, their behaviour is skewed toward detail and tensed eye and body musculature. The eye problems nearsighted people present can provide insights into greater internal imbalances and skewed patterns of reality. The personality of nearsightedness transfers to how people think, how they speak, the way they see themselves, the way they interact with others, and the way they adjust their posture. These people tend to be rational thinkers, which helps them to make sense of the modern, logic-driven society they live in. Being logical allows them to be pragmatic and more focused without becoming emotional. This allows an assigned job or task to be meticulously completed, which may facilitate job advancement or a financial reward. Clinical research papers have shown a strong association between nearsightedness and analytical and intellectual activities and high intelligence, which these individuals frequently have. It is possible to identify the anomalous near clinical findings that drive myopia development with a functional vision assessment by a developmental or behavioural optometrist. The solution is not to prescribe compensatory lenses for distance for full-time wear, especially at near, but, rather, appropriate low plus-powered lenses at near as determined by stress retinoscopy for all near work. Another method used to intervene, prevent or reduce myopia progression is through a vision therapy program. Myopia is mirrored in the mind, in the emotions, and in the body as a whole. Nothing can be done to change myopic perceptions without working the entire body as one unit. Here, an individual at risk for developing or showing early signs of myopia is given activities to change the neurology that will bring stability and support to the visual system at near. Other therapeutic options include low-powered BI or BD prisms, bifocals, multifocal contact lenses, orthokeratology lenses and low-dose atropine. Researchers have also recommended turning off digital devices and going outdoors. There is a very strong correlation between myopia and overusing electronic devices while not being outdoors enough. Some studies suggest that myopia might be linked to lower levels of vitamin D, the sunshine vitamin, but it is unclear why spending time outdoors benefits myopes; studies cannot prove if the primary reason is UV radiation, vitamin D concentrations, light intensity or other factors. People with myopia should also eat a diet that includes Omega-3 fatty acids, lutein, zeaxanthin, vitamin A, vitamin C and vitamin E that are found in a variety of foods. You don’t want to be shortsighted, do you? Help your patients with nearsighted behaviours to refocus, change their perceptions and expand outward into the world. You can learn more this summer in Niagara Falls, ON at the Canadian Optometrists in Vision Therapy and Rehabilitation’s Myopia Conference, which will feature classical and behavioural international optometry lecturers. Visit www.visiontherapycanada.com for further information. This is the second of two developmental optometry stories. The first story appeared in the March/April issue of Envision: seeing beyond magazine.